To mobilise society is a hard task in all democracies, as it requires good campaigns, funds, clear objectives and a structured offline social network. It even seems to be more difficult in the Hungarian context which is characterised by a young democratic political culture and a growth of institutionalised corruption. The high level of corruption has led too many citizens to believe that political participation is an activity which “decent” people keep a distance from. However in 2009 LMP (Lehet Más a Politika / Politics Can Be different), an anti-establishment Green party formed by an active group of people from Hungarian NGOs, appeared on this scene with clear objectives: to unite civil society, try to improve radically Hungarian democracy and renew Hungarian politics. How did they manage to enter into the Hungarian Parliament? 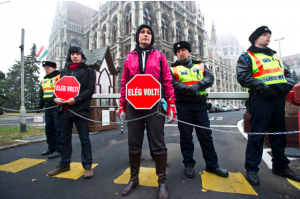 Are they succeeding in mobilising Hungarian society? Which is their performance in the difficult Hungarian reality? GEF’s Campaign Handbook spoke with Gergely Karácsony (LMP Member of Parliament and campaign leader of the 2010 elections) Laszlo Varnai (member of the LMP board and local councillor) and András Kövesdi (member of the LMP political council) about these and other issues. LMP entered the political scene in a difficult political environment in 2009. Gergely Karácsony asserts that the “Hungarian political landscape was dominated by a left-right conflict, although it wasn’t about real policy preferences but about symbolic questions of the past”. A core debate has been the relation of each party with the past authoritarian regimes. Therefore, the Hungarian scenario has been dominated by a “left”, the Socialist Party (MSZP), which is a successor of the former communist regime; and by a “right”, that is divided between an anti-communist populist party (Fidesz) and a neo-nazi far-right party (Jobbik). Therefore, citizens have strong identity differences and both sides are tempted to be mobilised by hate, fear, frustration, and growing existential insecurity. Alternatively, some voters couldn´t be mobilised at all. But this scenario changed with the entrance of a new party, LMP. This party has distanced itself from the historical debate and has brought to the forefront topics such as social inclusion, justice, sustainability and the need for a participatory and transparent democracy. For Gergely Karácsony, LMP´s formation can be interpreted as the beginning of the activation of Hungarian civil society against the corrupt and incapable political elite. LMP has its roots in the alter-globalisation movement “Another World is Possible” that served as an example for the foundation of the party. LMP was the result of a strong informal network of green, human rights and social NGOs. Laszlo Varnai “Gradually people from this movement recognised the great level of dependency they had on the state, and therefore decided to form a political party. This decision was also inspired by the examples of the Austrian and German Greens”. Precise time: The success of LMP was mostly, as Gergely Karácsony pointed out, the result of the vacuum left, on one hand by the Socialist Party after many years of “bad” government, and on the other, by the collapse of the Liberal Party. Laszlo Varnai asserts that many people who voted for the liberal party before decided to switch to LMP. The defeat of the Socialist and Liberal parties was the result of the growth of an anti-establishment feeling in Hungary. New message from a new actor; A youthful new message is one of the great successes of LMP. In the words of András Kövesdi “LMP did a campaign similar to Obama’s”, bringing hope and fresh air to the electorate. 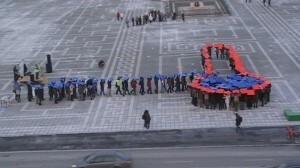 The key element was to send the positive message “Politics can Change” to Hungarian people. The image of being a new party with “clean hands” gave LMP a lot of support. Simplification and adaptation of the message: LMP’s campaign message had to be clear and adapted to the Hungarian context. In Eastern Europe´s relatively new democracies, environmental consciousness is generally weaker than in Western Europe. Thus LMP could not just identify themselves as a Green party, as this label is too narrow in the Hungarian context. Although LMP is a centre-left eco-political party with a multi-issue approach, the messages of the campaign put forward several clear demands: transparency in political life, fight against corruption and discrimination and freedom of the press. LMP knew that primarily disaffected electors would vote for them. Enthusiasm; The party had really little funds for the campaign. In fact, all the money came from small individual contributions. In the Hungarian context, where parties spend on their campaigns two or three times more than what is permitted by law, LMP used the resources they had; enthusiastic members and many NGO activists used to have great successes with little budgets. During the 2 first years in Parliament, LMP has had to face many controversial government policies. In the 2010 elections Fidesz achieved a huge majority and Jobbik became the third political force, not far from the Socialists. Since 2010 Fidesz’s government has reshaped Hungarian institutions and has ruled over the media according to their own interests. In fact, Fidesz has approved a new Constitution and media law that is undermining, even further, Hungarian democracy. As Gergely Karácsony says “LMP has to apply smart tactics and strategies to contribute to a change of government”. LMP’s main political strategies are, on one side, keeping the differentiation from the other Hungarian parties and, from the other side, increasing Hungarian social cohesion. Referring to the first one, LMP is trying to preserve its civil society component. LMP fears to be seen as a technocratic party, just as the other ones. In fact, the party consciously preserves its civil society rhetoric and tries to keep on working with close connection to the citizens and civil society organisations. To distance themselves from the other political forces LMP has also the internal policy of not going into coalition with any party, even if it means breaking Fidesz’s opposition. The second strategy of LMP against the government is to increase social cohesion and try to unify society’s actions. The Hungarian Prime Minister once said that his objective was not to build “a strong society but a strong political power”. Therefore, LMP considers vital to motivate society to protest and step up against this kind of politics. In fact, as András Kövesdi explained us, LMP has been promoting protests in the streets, LMP members of parliament have chained themselves in front of the Parliament against the reform of the electoral law and other antidemocratic laws, raising awareness about topics that had never been spoken before in Hungarian society. A paradigmatic example was the protest in Kozgep Inc’s building (a construction and metal company that has benefited a lot from public funds) to point the finger to the hidden influence of big business on Hungarian politics. To the same end, LMP supported a referendum campaign in April this year, which managed to gather 160,000 signatures on social issues but unfortunately missed the threshold required to have it debated in Parliament. The entrance of a civil umbrella organisation created via Facebook, “One million people for the press freedom in Hungary” has also been a very important promoter of Hungarian mobilisations. This organisation is promoting similar goals as LMP and is raising similar issues. We have to be aware that in Hungarian context organisations have to careful not to get too closely linked to LMP, as somehow they are still dependent on the state money. Although all these protests have not yet shaken the power, they have meant an important change in the Hungarian political culture and have helped to break the myth that politics was only an experts’ duty. To conclude, one of LMP’s biggest challenges regarding the next national and european election in 2014 is to persuade disappointed citizens who voted for parties such as Jobbik to believe in LMP’s message. In fact, Jobbik’s success could also be seen as a result of this growing anti-establishment feeling accompanied by a generation shift. As with LMP, the majority of Jobbik’s voters are young people tired of the “politics as usual”. GK: “LMP has to persuade these disappointed voters and explain to them that they should not try to find opponents in European institutions, jews or the Roma minority. This criticism should be connected with the bad governance of the past decades and the democratic deficit in Hungarian institutions. LMP’s duty is to persuade people that there is only one remedy for the discrepancies of democracy and it is even more democracy”.